Situated in Manitou Springs, the Iron Springs Chateau began as a candy and cigar store that was operated for several years beginning in 1880. This open-air summerhouse, that was constructed at the site of the Ute Iron Springs, changed owners several times before the Iron Springs Company purchased it and began to sell the “iron springs” mineral water commercially. 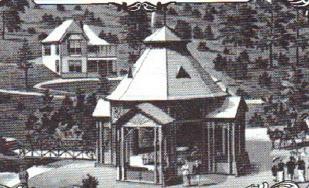 The Iron Springs Company built an Adirondack style wooden pavilion over the Ute Iron Spring, which it sold in 1887 to J.G. Hiestand, who built the original building now known as the Iron Springs Chateau Melodrama Dinner Theater. the Iron Springs Geyser remains accessible to the general public. In 1964, the Chateau Players formed, and the Iron Springs Chateau style of melodrama and Vaudeville entertainment was born. 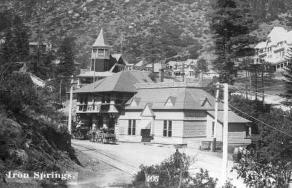 Today, the Iron Springs Chateau still sits at the base of the Pike’s Peak Cog Railway, and continues the tradition of great food and fun for tourists and locals alike in the Pikes Peak region! *History condensed from “A Brief History of the Iron Springs Chateau and The world Famous “Iron Springs” of Manitou”, by Vicki Kelly.